We explored lights in our Dark Den. We have been improving our computer skills and we made 'Scary Spuds'. We thought they were funny. What do you think? We celebrated Bonfire night by finger painting fireworks and collaging bonfires. 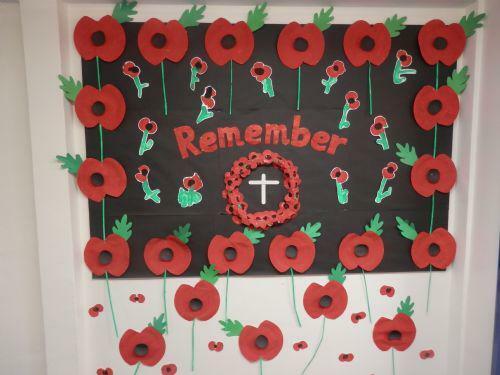 We made Poppies and displayed them in our corridor. Children in Need was good fun! We could wear our clothes back to front and inside out. 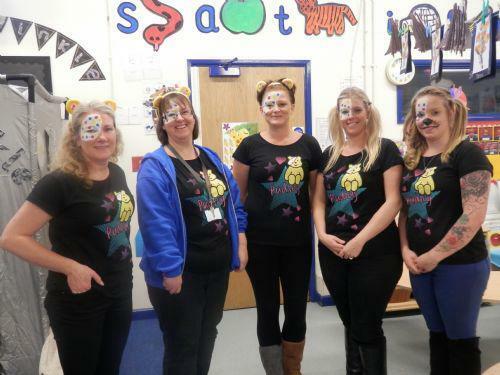 Our teachers looked funny too. We had an 'Anti-Bullying' week in school. We decided to make friendship bracelets. First we designed them on the computer, then we made them. We are all settling really well and making new friends. We have been busy doing lots of activities. We have painted our own portraits and they are displayed in our corridor. We loved getting messy painting our hands to make handprints! We then made the most delicious apple pies! We peeled and chopped the apples. We cut out the pastry into circles. We cut out stars and cooked the pies. We read the story 'The Enormous Turnip' and went digging in our garden for lots of yummy vegetables. Then we cut them up and made vegetable soup. Dewi the Dinosaur came to see us. He showed us how to brush our teeth correctly. We listened to a story about Peppa Pig going to the dentist.